The winner of New York City's "Taxi of Tomorrow" competition has now begun production at Nissan's commercial vehicle plant in Mexico. In 2011, after two years of competitive trials, Nissan's custom-designed NV200 Taxi was chosen to become New York City's Taxi of Tomorrow. After refinements, engineering finalization, and more testing, the taxis are finally entering production to begin deliveries by 2014. The taxis, based on Nissan's popular NV200 small package delivery van, are heavily modified to meet the requirements of New York City's huge taxi fleets. These include passenger accommodations, handicapped entry and egress, lighting, and the exclusive New York Taxi Yellow paint. Special underfloor sealing and other specifics have also been engineered for the taxis to withstand the harsh weather and driving conditions NYC boasts. A panoramic roof to keep tourists interested in the city's skyline was also included in the taxi. Since winning the competition in 2011, Nissan has been perfecting the car. 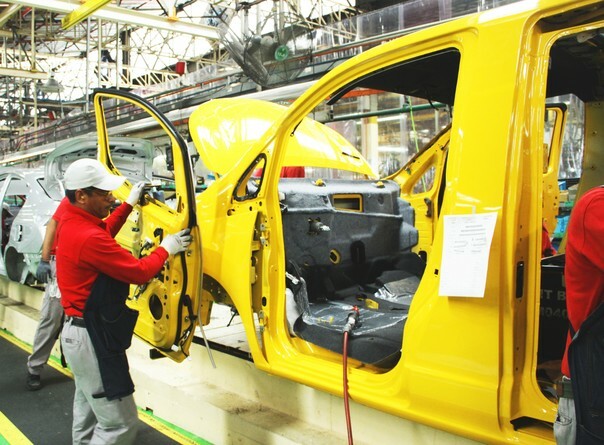 This process included building a New York Avenue testing range at Nissan's Arizona facility to simulate the harsh conditions of New York taxi life. Vehicles logged more than 155,000 miles on the range, collecting data to refine the vehicle. The Taxi of Tomorrow uses a 2.0-liter, four-cylinder powertrain tuned to enhance emissions and fuel efficiency at city level. The driver's seat is six-way adjustable, navigation is standard as is a backup camera, and an intercom system for driver-to-passenger is included and also has a hearing loop system for the hearing impaired to use. The NV200 Taxi is also the first to ever be fully safety tested with the full taxi partition installed - these are usually "after market" additions, not privy to safety tests. Entry doors for passengers are sliding doors, making entry and egress easier and to keep the doors from swinging out to strike passengers or bicyclists on the road. Lighting further enhances this to let people outside the vehicle know that doors are opening. The taxis enter service in 2014.